I've worked on this one for a few days now, and finally finished it up tonight. This was going to be a plein air piece a couple of Sunday's ago, but after walking down the creek (in the creek) for a long ways, picking the perfect view, and after setting up in the creek, standing in water half way up my shinbones, after toning my canvas, my 8 year old companion decided she needed to GO. So we went. Luckily I had taken a few photographs of the scene, which is what I worked from in the studio. That and my memories of the day. This was a quick commission I did for the owner of this cabin. Had a week to get something good down on the canvas. Worked on site for a few hours and finished up in the studio. Gorgeous day today. Temperature in the low 70's. I love this time of year. I set up and did a little outdoor painting today. This one is pretty straight-forward. Trees. It measures 20" x 16", and is oil on oil primed linen panel. I'm throwing in a pic of the scene, the rough-in, and the finished piece. You can see what I changed in the painting, from what I was seeing. Most notable is the warmth I added to the foreground. Here's a small one to add to the Bowling Green, Kentucky Street View Series. I painted this one this afternoon on Crocus Creek in Cumberland County, Kentucky. Had two of my girls along. One read, while the other got extremely wet. Well, we all three got pretty wet before it was over. Gotta love these great spring days. 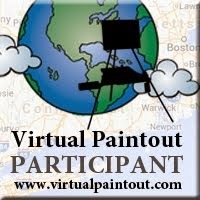 Did this one for the Virtual Paintout. This month we travel to the Canary Islands.